Since I took 5 days off from blogging (although not from Alena’s Life, thankfully), I missed my weekly recap last week. I did continue posting on Facebook throughout the weekend, so here’s where I’m at. Day 16: Today I am thankful for sports. Yep, you read that right. I love watching sports (not competing unfortunately). From Rec league soccer to seats in a stadium and everything in between, I love being a sports fan. There’s a release in cheering on athletes that I just don’t find anywhere else. So thanks to all the athletes out there who entertain me. Day 17: Today I am thankful for weekends. Just when I think I can’t “go” another day, the weekend arrives. I can slow my step, breathe deeply and recharge. 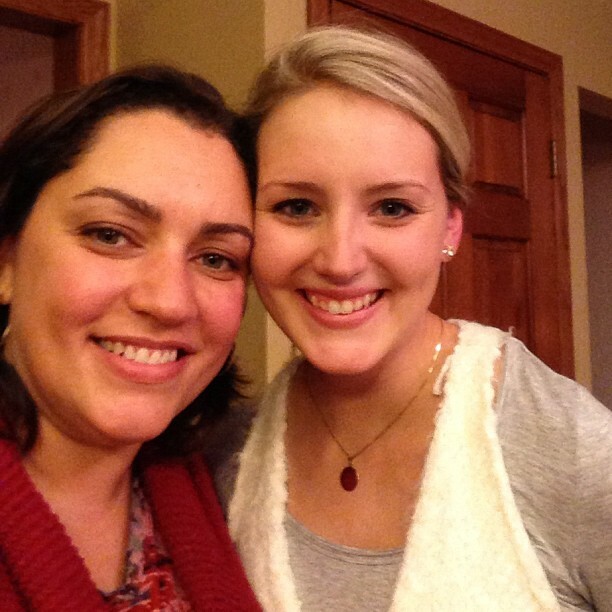 Day 18: Today I am thankful I got to spend the day with my mom. She is just the best and I miss seeing her every day. A few hours doesn’t make up for daily contact, but it sure was great. Day 19: Today I am thankful for a particular book. TELL THE WOLVES I’M HOME is not only a really good book; it’s the best novel I’ve read all year. This story carried me on its back in a deeply personal and revelatory way. I can’t say enough about how much I loved it, but I tried. Day 20: Today I am thankful for good editors. During my years working for newspapers and writing for a great magazine, I was mentored, challenged, taught and encouraged by some of the best. I offer special thanks to Mary Haley, Susy Schultz, Cindy Richards and Tamara L. O’Shaughnessy for making me a better and more confident writer. In their honor I promise to write from my heart, use strong words and know when to stop. Day 21: Today I am thankful for a 5-day weekend. After a couple of months of working evenings and weekends regularly, I am in serious need of several consecutive days of downtime. Best of all, I’ll share these days with my family, both immediate and extended. Let the relaxing begin. Day 23: This evening I’m thankful for comfy pants, a fire, takeout and A Christmas Story on DVD. Day 24: Today I’m thankful for 30-gallon Hefty Flex bags. In the past 24 hours I’ve filled 7 of them just from the toy room and basement. My sons are abundantly blessed but a deep purging is needed before Christmas hits. Day 25: Tonight I’m thankful for Downton Abbey. Settling in for the PBS recap/preview, grateful that great television is still being made. Can’t wait for Season 3. Only one more week of daily thank-giving. This has been a good month and a great exercise for me. What are you thankful for today? What are you currently reading? Reading the final pages of Taft by Ann Patchett. Earlier this year I endeavored to read all of her books by December. This is the last novel on my list. In typical Patchett fashion, I’m caught up in the people and the place. Not her best piece of work, but a good read. Listening to Dennis Lehane‘s Live by Night. This is a follow-up (sort of) to his novel The Given Day in that some of the same characters show up. This story is more Boardwalk Empire than historical fiction, but I’m loving it nonetheless. What did you recently finish reading? 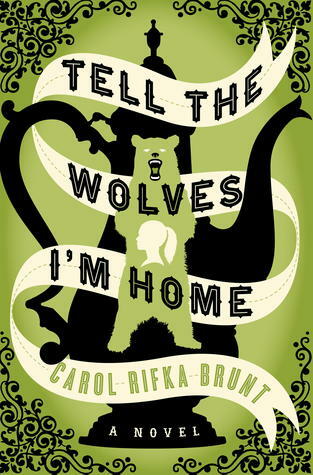 I absolutely fell in love with Tell the Wolves I’m Home by Carol Rifka Brunt. (See my previous post for my rave review and then, please, read it yourself.) On the other hand, I had to give up on the audio version of All the Pretty Horses. Cormack McCarthy remains one of those great authors I’ve never read. What do you think you’ll read next? Next up, one of my favorite authors. I just got Barbara Kingsolver‘s new novel, Flight Behavior. I also have a new short story collection by Alice Munro. How can I explain the way this beautiful novel touched my heart? I was almost afraid to read it after hearing several friends and fellow-readers tell me I just “had to” read this because it’s “just my kind of book.” Well, they were all right. Tell the Wolves I’m Home is everything I love in a book – a thoughtful, socially awkward young narrator coming of age at a particularly dramatic historical moment. June Elbus is 14 years-old in 1986 when her beloved uncle dies of AIDS. Obsessed with medieval culture, June is caught between childish games of imagination and the harsh realities of death, fear and discrimination. Struggling with the love-hate relationship between herself and her 16 year-old talented and popular sister, feeling orphaned by her busy-at-work parents and full of teenage self-loathing, she still comes across as tender and sympathetic. After her Uncle Finn’s death, June tries to make all of these pieces fit together. Left with only a portrait he painted, she cautiously accepts the friendship of Finn’s lover, Toby, a man her mother calls, “Murderer.” In Toby, June hopes to reconnect to Finn, to figure out what their relationship was and to understand the snatches of conversation and missing pieces of her family’s relationships. What he’d said didn’t really make sense, but there was a tiny flicker of something I felt like I was almost catching. Just for a second it felt like I understood, and then it evaporated again. That feeling of almost understanding permeates much of this novel, leaving me eager to always turn the next page. IN the way of a young girl, the chapters are short, breaking up June’s life from one moment to the next, but the sense of longing, the desire for everything to make sense, lies under the action, holding the book together tightly. I knew the way lost hopes could be dangerous, how they could turn a person into someone they never thought they’d be. All of these factors would easily have led to a 4-star book. What pushes this to 5-stars is the fact that I thought Carol Rifka Brunt might have been writing my life. I was the same age in 1986, and while my AIDS inflicted “uncles” weren’t related by blood, they were artists who showered me with love and acceptance that I didn’t find anywhere else. I remember vividly the agony of being caught between childhood and adult concerns and my desire for the “magic” explanation. I could go on and on about the brilliant layers of guilt, fear and discovery to be found in this novel, but I’ll stop here and simply savor the feeling of never wanting it to end. I’ve continued to post one thing each day for which I am thankful over on Facebook. Not only have I appreciated the challenge of coming up with 30 variations of “my life,” but I’ve really enjoyed seeing what others have to say during this month of Thanks. Here’s a round-up of Week 2 posts. I encourage everyone to take a moment to give thanks for one thing each day. Day 9: Today I am thankful for Origins bath and beauty products (or, as I like to call them, “my lotions and potions.”) I first discovered their incredible bubble bath called “Gloomaway” years ago and have since samples scrubs, hair treatments, lotions and lip balm. Gloomaway lotion remains my favorite product (maybe because of the name), but I so love to see that green box on my birthday. Thanks hon. Day 10: Today I am thankful for girlfriends. Over the course of my life I’ve had friends who’ve held me up, pushed me forward, caught my falls and, most importantly, made me laugh. Last night I was reminded again of the importance of friends. So to all of you old and new, thank you. Day 11: Today I am thankful for the thousands of men and women who’ve bravely served in defense of our country and our rights. I think specifically of the men in my family, of whom I am so proud. I understand that my way of life would not be possible without veterans. I honor all of them today. Day 12: Today I am eternally grateful for saying “yes” to my husband’s marriage proposal. It was the smartest decision I ever made. I thank him for the luckiest 13 years of my life. I found a partner for the journey and the greatest dad for our sons. I love knowing he’s got our backs, always. Day 13: Today I am thankful for technology. Can’t imagine life without email, social media or my iPhone. Am I addicted to all these screens? Probably. I’m OK with that. 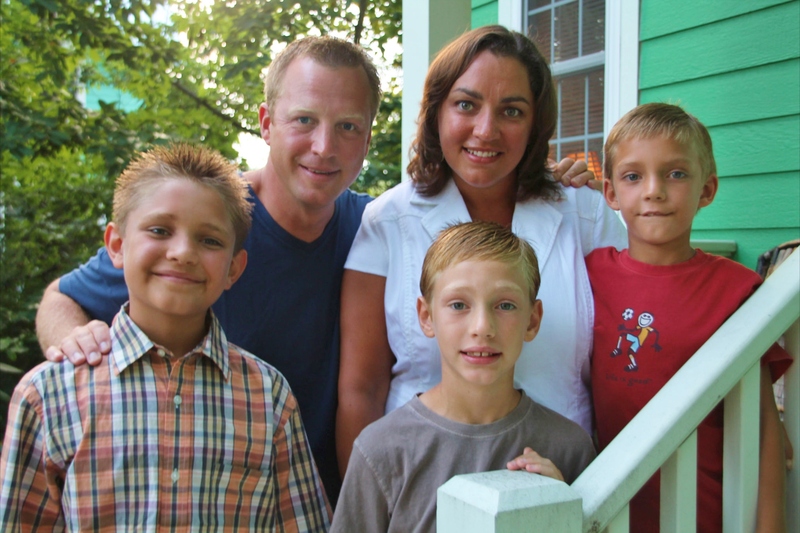 Day 14: Today I am thankful for my three sons. (Yes, I’m thankful for them every day, but today I’m putting it in writing.) Each in his own way brightens my life, touches my heart, makes me crazy and fills me with pride. My sons are terrific human beings. I am a lucky mom. Day 15: Today I am thankful for Night Owls Book Club. It’s hard to believe I’ve been meeting with them once a month for over 10 years, but I’m grateful for over 100 terrific book discussions, exposure to titles I would have never read, and the chance to make some really nice friends. All ages, all reading tastes and all opinionated, Night Owls is a standing date on my calendar. What are you currently reading? Almost finished with The Perks of Being a Wallflower which I am loving. There’s something so comforting about YA, where all the emotions are broiling right there on the surface. It’s both easy and satisfying. My audio choice, on the other hand, is the dense and mysterious All the Pretty Horses. I’m not sure I’ll make it through 10 discs, but I feel a responsibility to read Cormac McCarthy. What did you recently finish reading? Took me a while to finish Chris Cleave‘s Gold, but I really enjoyed it. Aso finished the audio version of Lots of Candles, Plenty of Cake by Anna Quindlen. She’s simply a terrific essayist. What do you think you’ll read next? Next in hardcover, the completion of my Ann Patchett Project. I finally have a copy of Taft. But Tell the Wolves I’m Home is calling my name too. On Facebook, I am participating in Thirty Days of Thankfulness. Some are silly. Some are more emotional. But every morning I stop for a minute to think of one thing for which I am truly thankful. It’s an excellent exercise in gratitude. Seeing others’ posts has also taught me a little something about how lucky I am. So here are my “thanks” from Week 1. Day 1: Today I am thankful for my family — who never fail to surround me with love in good times and bad. Day 2: Today I am thankful that sweater-vests are back in style. Hooray for fall fashion. Day 3: Today I am thankful for non-fat lattes and my wonderful husband willing to go out first thing in the morning to get one for me! Day 4: Today I am thankful for turning the clocks back. One extra hour on this lazy Sunday morning is fine by me. Day 5: Today I am thankful for my job. Even on a Monday, I look forward to starting a new week and know how blessed I am to be in a good place with good people, doing something I love. Day6: Today I am thankful for democracy. Yes, our system of government is flawed, but it’s still the best system there is. And I’m truly thankful I live here, and not somewhere else. Vote, please. Day7: As ever, my friends are deeply divided in their response to yesterday’s election; but, again, I am thankful for our right to share our opinions and our voices. I do hope at the end of the day I will be thankful for the end of campaigning. Day 8: Today I am thankful audio books. Although I was very late to the audio book game, I am so grateful that I can still read with less time to do so. The Listening Library series of Harry Potter books has also allowed me to share a reading experience with all three of my sons, which is pretty cool.